Note: Click on the names to go to their respective families below. records say he was born in Castolón but he was more likely born in. nearby La Coyota which was a settlement not officially recognized. born February 12, 1926 in the Terlingua area. born March 19, 1932 in Terlingua. Alberto died on April 19, 1933 of colitis as an infant 13 months later. born December 19, 1937 in Rotan, Texas. Felix was born in May 1894. 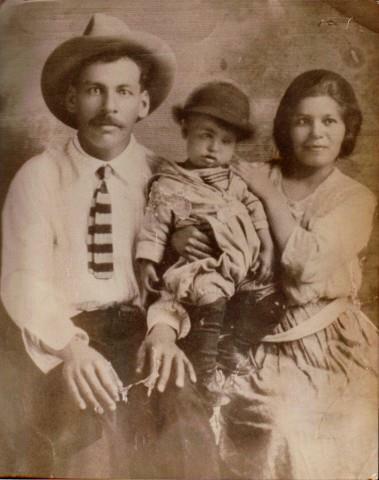 Records show Felix and Paula were born in Castolón which had a US post office and was officialy recognized, but it is quite likely that they were actually born in La Coyota a small settlement with no official designation about two miles west of Castolón right on the edge of the Rio Grand to its west and the Alamo Creek separating it from La Coyota's cemetery. Felix' parents had moved there from Fort Stockton and were among the original settlers of La Coyota around 1884. 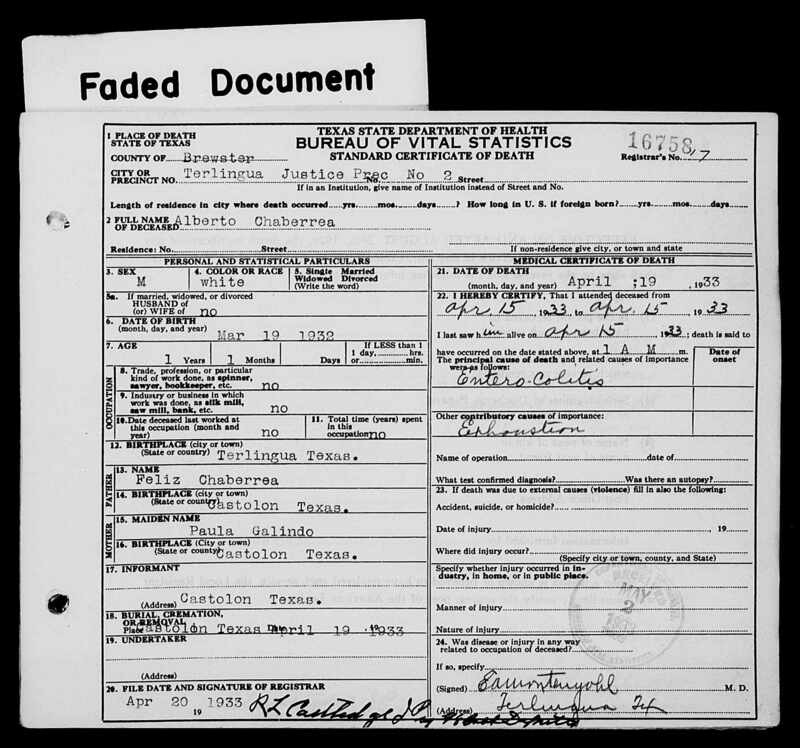 The 1910 US Census says Felix was working as a laborer on a ranch in the Terlingua area. Felix and Paula lived in the Terlingua area until 1933. In 1933 they moved to Big Spring and lived there and in Rotan, Texas until their deaths. Paula died of liver cancer May 13, 1938 in Rotan and is buried there. 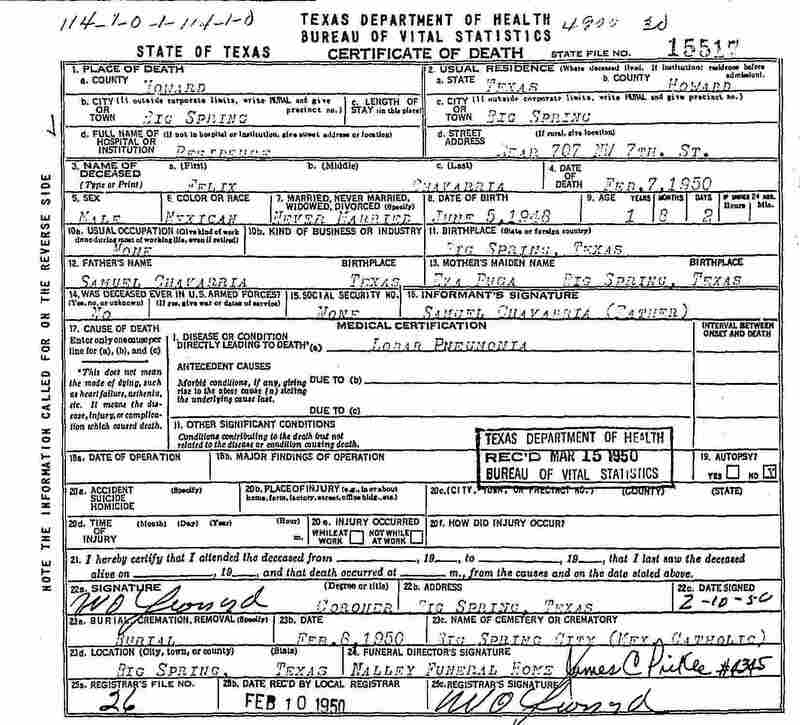 Felix died of uremia in Hall-Bennett Hospital, Big Spring June 15, 1970 and is buried in Mt. Olive Cemetery, Big Spring. He died May 15, 1983 in Big Spring. served in the U.S. Army during the Korean War and was honorably discharged. Manuel had two sons both named Manuel by different mothers. (1) Son Manuel Ruiz Chavarría, Jr. was born March 7, 1948. He served in the U.S. Army in Vietnam and was honorably discharged. Manuel Ruiz Chavarría married Karla Dean Greenhill September 16, 1974 in Big Spring. Karla was born November 25, 1956 in Big Spring, the daughter of Leon Walton Greenhill and Ruby Ruth Pope. In July 2012 Manuel Galindo Chavarría was living in Big Spring. a. Lisa Jean Chavarría (daughter) was born January 30, 1975 in Big Spring. b. Ronnie Lee Chavarría (son) was born January 12, 1979 in Big Spring. c. Tommy Justin Chavarría (son) was born August 27, 1980 in Big Spring. d. Lacey Janelle Chavarría (daughter) was born February 19, 1986 in Big Spring. Manuel Galindo Chavarría had second son by a different woman also named Manuel. are aware of). Our father has since passed, he was Felix & Paula's oldest son, I live in Little Rock Arkansas." Manuel Galindo Chavarría, Sr. married Guadalupe Cervantes. Before their marriage Guadalupe Cervantes was married to Candelario Núñez Bihl. He was born February 13, 1913 in Texas, the son of Encarnacion Bihl and Josefa Núñez. Guadalupe and Candelario initially lived in Presidio County. Later they moved to Big Spring, where he worked as a ranch hand. He died in Big Spring February 14, 1949 and is buried in Big Spring. (1) Ruben Bihl was born February 8, 1938 in Presidio County. He is deceased. (2) Ismael Bihl was born May 19, 1940 in Marfa, Texas. On February 14, 1959 he married Julia Perez in Odessa. years. He died in Covenant Medical Center, Lubbock May 21, 2010 and is buried in Mt. Olive Memorial Park, Big Spring. a. Virginia Bihl was born January 21, 1960 in Big Spring. She married Daniel Hidalgo June 26, 1982 in Big Spring. b. Ismael Cervantes Bihl, II was born September 7, 1961 in Big Spring. In May 2010 he was living in Daly City, California. c. Angelita Bihl was born May 11, 1963 in Hockley County, Texas. She married Manuel O. Sosa, III on 30 December 2000 in Big Spring. 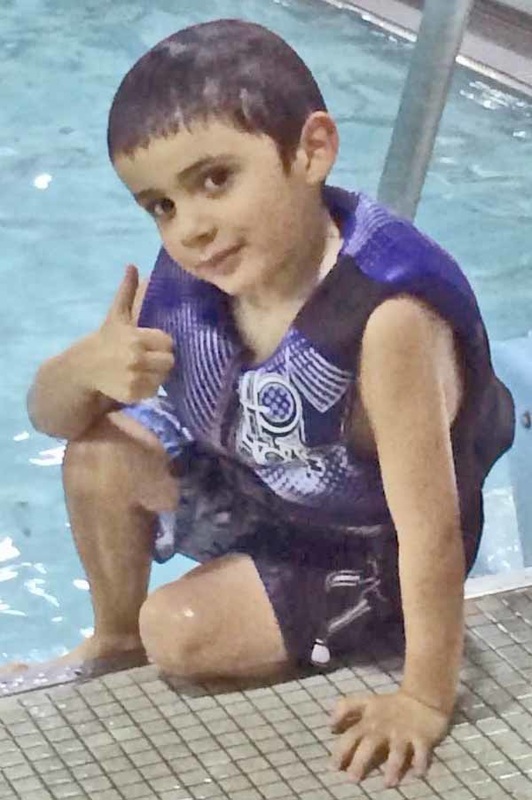 They were still living in Big Spring in May 2010.
d. Guadalupe Pérez Bihl was born May 17. 1966 in Big Spring. She married Ramon Portillo In Big Spring December 12, 1987. In May 2010 they were living in San Angelo. 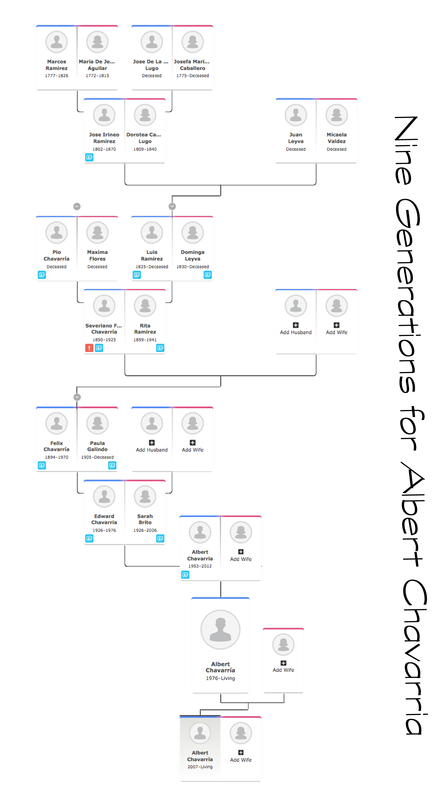 (3) Eidolina Bihl was born July 27, 1942 in Presidio County. She is deceased. (4) Olga Bihl was born August 25, 1944 in Howard County. She died on Glenn Cantrell’s farm in Howard County June 8, 1945 and is buried in Big Spring. (5) Elvia Bihl was born April 30, 1946 in Big Spring. She is deceased. (6) Salvador Bihl was born June 8, 1948 in Big Spring. In May 2010 he was living in San Angelo. 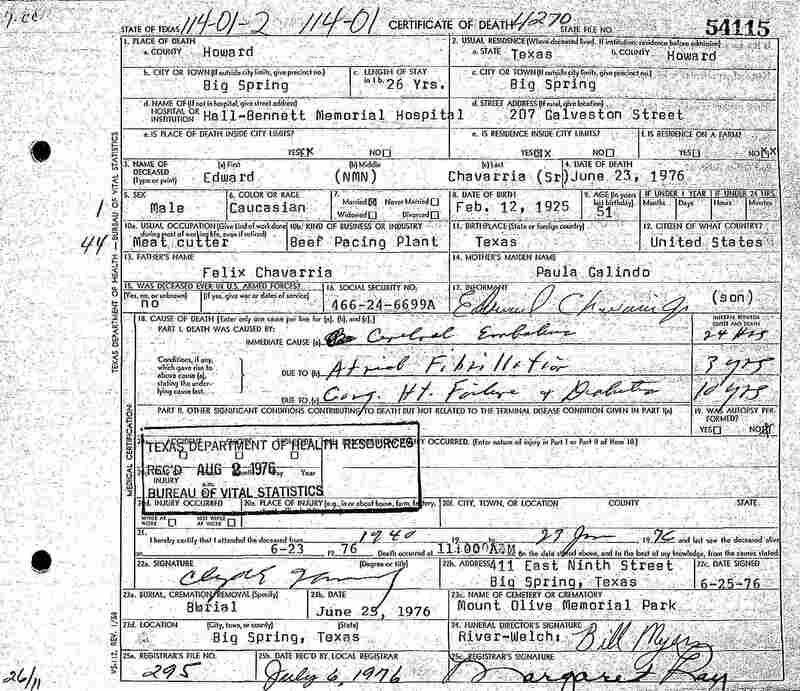 Manuel Galindo Chavarría, Sr. married the widowed Guadalupe Cervantes January 28, 1966 in Big Spring. They are buried next to each other in Trinity Cemetery. (1) Alicia Chavarría was born October 21, 1950 in Big Spring. a. James Lee Morales was born August 20, 1967 in Big Spring. He is retired from the U.S. Air Force. a. Kennith Bryan Miller was born October 5, 1969 in Big Spring. He married Desiree Dyer. U.S. Air Force. Both Alicia and Larry are retired from the U.S. Air Force and in July 2012 were living in Little Rock, Arkansas. a. Daughter Kimberlee Ann Williams married Evan Schmidt in May 2010. John C. Stennis, CVN 74. He was disabled while on active duty in the Afghanistan War. 2. Edward “Lalo” Chavarría was born February 12, 1926 in the Terlingua area. Edward aka Eduardo died on June 23, 1976 in Hall-Bennett Memorial Hospital. Sarah Brito was born February 12, 1926 in Midland, the daughter of Evaristo and Braulia Brito. Sarah died in Big Spring September 9, 2006. Both Eduardo and Sarah are buried in Mt. Olive Cemetery, Big Spring. meat cutter in a beef processing plant. (1) Paula Chavarría was born February 6, 1947 in Midland. She died in Big Spring December 25, 1996. 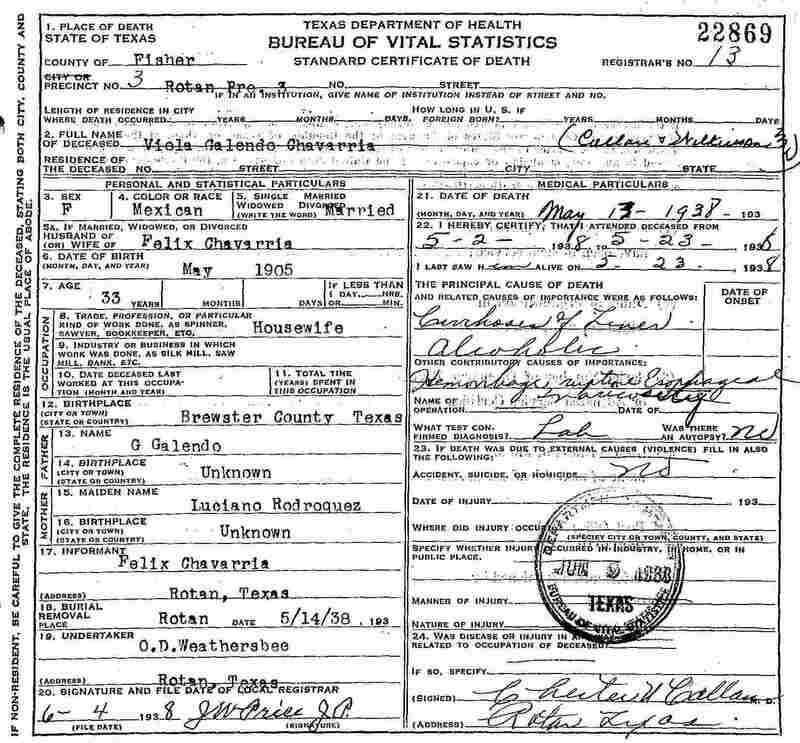 Paula's married name was Villarreal. 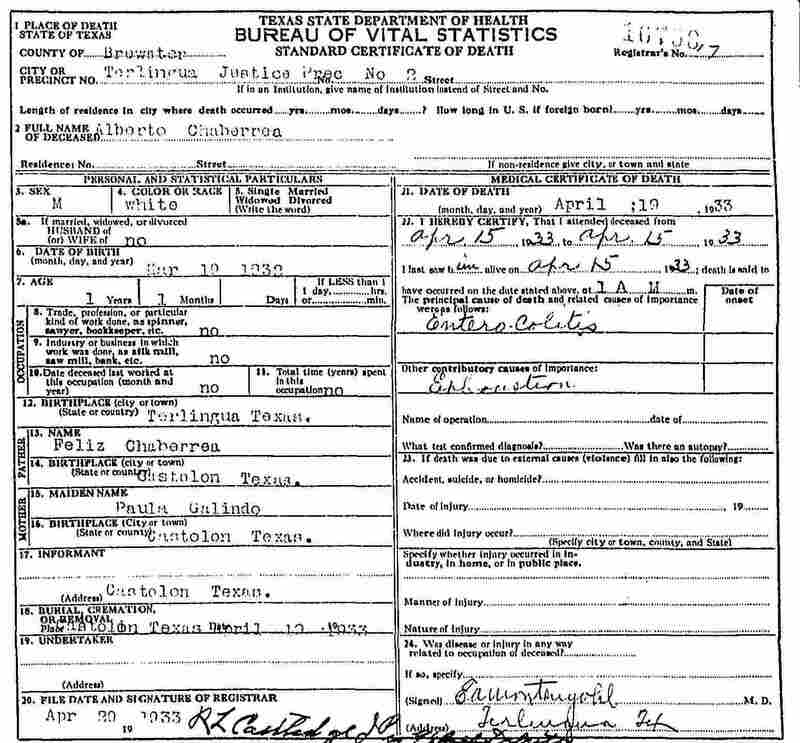 (2) Yolanda Chavarría (married name Villareal) was born October 28, 1949 in Big Spring. (3) Olga Chavarría was born in Big Spring July 1, 1951. She was living in Big Spring in September 2006. (4) Edward Chavarría, Jr. was born in Big Spring October 19, 1952. He died in San Antonio July 9, 2004. (5) Albert “Beto” Chavarría was born in Big Spring November 18, 1953 and lived there all of his life. Albert died in Medical Center Hospital, Odessa January 31, 2012. He worked as a roustabout in the oil fields. Albert had two wives. His first wife was Dorothy LaRue Hestor. His second wife was María Holguín. a. Albert Chavarría, Jr. was born November 17, 1976 in Big Spring. In June 2016 Albert Jr. and his wife Genoveva were living in Anchorage, Alaska. Albert and Genoveva have x children. 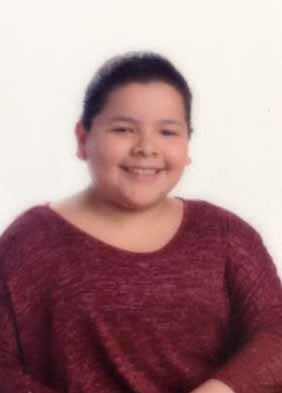 i. Xiomara Chavarría born May 14, 2004 .
b. Felix Chavarría was born December 3, 1977 in Big Spring. In January 2012 he was living in Austin. He was living in Big Spring in January 2012.
d. Manuel Rey Chavarría was born November 4, 1982 in Big Spring. Manuel Rey married Ventura Gonzales January 10, 2000 in Big Spring. Ventura Gonzales was born November 28, 1980 in Big Spring. Ventura's parents were Jose Gonzales and Maria Elena Velasquez. In January 2012 Manuel Rey and Ventura were living in Big Spring. Albert married María Holguín August 11, 2011 in Big Spring. María's parents were Cruz Moreno Holguín and Teresa Rubio. Albert and María had no children as a couple, but María had two children when they married. They are buried in Mt. Olive Memorial Park, Big Spring. a. Erica Marie Holguín was born in Midland May 8, 1983. 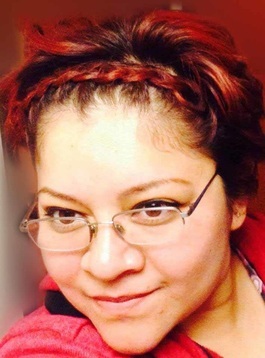 She was living in Big Spring in January 2012.
b. Emily Marie Holguín was born in Midland January 30, 1985, She was living in Big Spring in June 2016. (6) Son David Chavarría was born October 8, 1956 in Big Spring and died there August 10, 1995.
married name was Caño and she was living in Big Spring. January 3, 1923, the daughter of Senobio and Carolina Puga. Samuel died October 1, 1998 in Medical Center Hospital, Odessa. (1) Samuel Severiano Chavarría, Jr. was born January 16, 1947 in Big Spring. He was living in Odessa in October 1998. He died in Lubbock May 9, 2003.
is buried in the Mexican Catholic Cemetery, Big Spring. (3) Gloria Chavarría was born in Big Spring October 14, 1951. On December 11, 1970 she married Enrique “Ricky” Rodriguez in Odessa. They were living in Odessa in February 2011. 4. Isabel Chavarría was born June 16, 1929. Isabel Chavarría had two husbands. Her first husband was Felix Hilario and her second husband was Luis Ramirez. (1) Felix Hilario was born in Big Spring January 21, 1946. In May 2012 he was living in San Antonio. (2) Refugia “Ruth” Hilario was born January 15, 1950 in Big Spring. Refugia married Vicente Mendoza Calderon in Big Spring April 28, 1969.
they were living in Big Spring in May 2012.
a. Fidel Calderon was born May 2, 1975 in Big Spring. (3) John Joe Hilario was born January 16, 1952 in Big Spring. In May 2012 he and his wife Pilar were living in Carrolton, Texas. On May 6, 1958 Isabel married Luis Ramírez in Big Spring. Luis was born February 29, 1932 in Buda, Texas, the son of Carlos Ramírez and Lorenza Fabela. Luis served in the U.S. Army during the Korean War. After his Army service, he worked for R.E. James Gravel Co. He was the site manager and retired after 40 years of service. Isabel died in Big Spring February 23, 2001. 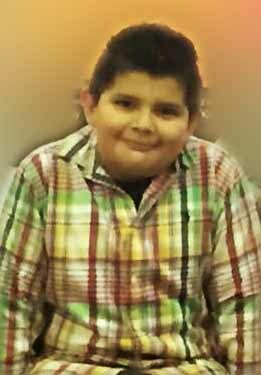 Luis died in Big Spring May 21, 2012 and is buried in Trinity Memorial Park, Big Spring. (1) Louisa Ramírez was born September 27, 1961 in Big Spring. She was living in Big Spring in May 2012. (2) Mary Elizabeth Ramírez was born August 10, 1967 in Walker County, Texas. She married Merardo Bonilla and in May 2012 they were living in El Paso. 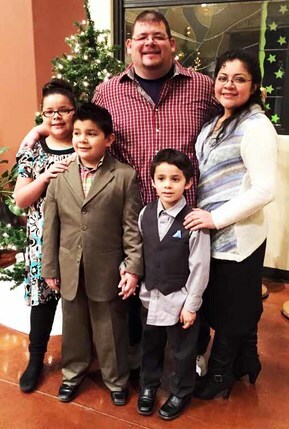 (3) Lisa Ramírez married Sam Rodriguez and in May 2012 they were living in Big Spring, Texas. (4) Josefine Ramírez was deceased by May 2012. 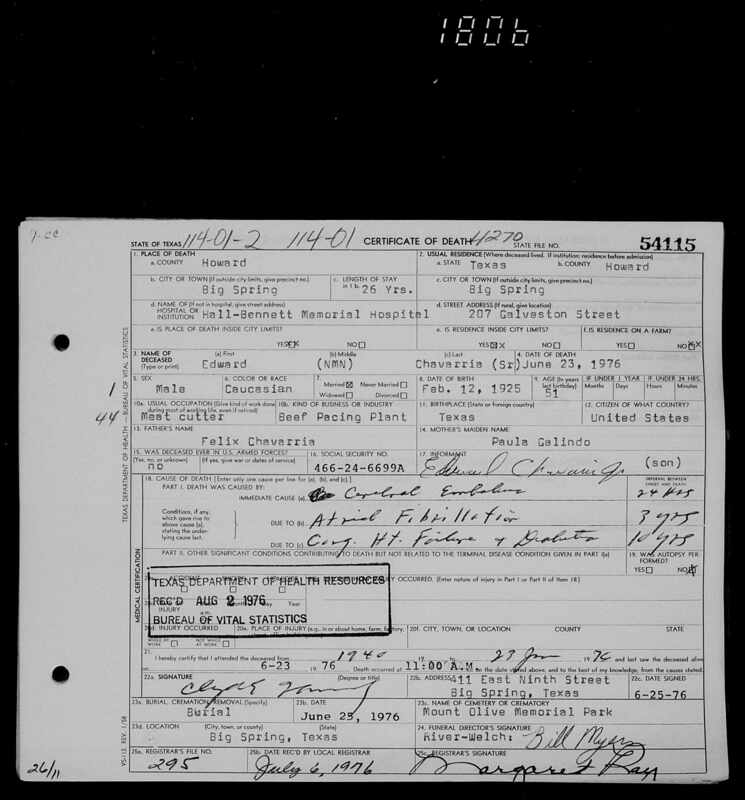 Her married name was Calderon. Alberto was born in 1932 in Terlingua. Alberto is buried in Castolón (probably La Coyota). 6. Daughter Reyes Chavarría was born January 6, 1934. She married Domingo “Danny” Hernandez Garcia. He died in Big Spring June 24, 1988. Reyes died April 24, 2002 in Scenic Mountain Hospital, Big Spring. (1) Daughter Juanita Chavarría was born in Big Spring May 30, 1956. She was deceased by February 2002. (2) Son Michael Rey Chavarría was born in Odessa November 15, 1976 and was living there in February 2002. (3) Son Joe O. Chavarría was living in Odessa in February 2002. (4) Son Joe M. Chavarría was living in Odessa in February 2002. (5) Son Mike Chavarría was living in Odessa in February 2002.
born in Rotan December 19, 1937. (1) Yolanda Domínguez born April 20, 1947 in El Paso. (2) Andres Dominguez born November 7, 1947 in El Paso. a. Andres “Andrew” Domínguez, Jr. born in Tom Green County April 18, 1964.
b. Laura Estella Domínguez born in Tom Green County July 10, 1966. After Pedro and Lucia were divorced he married María Chavarría. Pedro was born February 14, 1925 in Shafter, Texas, the son of Isabel Dominguez and Victoria Gonzales. He served in the U.S. military during World War II. They lived in Big Spring until about 1961, when they moved to Cheyenne, Wyoming. After a few years they returned to Big Spring, where Pedro died January 29, 1968. He is buried in Big Spring. (1) Victoria Domínguez was born in Big Spring October 8, 1957.
a. Son Brendan Zachary Rodríguez was born in Odessa August 7, 1987. (2) Son Isabel “Billy” Domínguez was born in Big Spring November 23, 1958. (3) Son Juan Jose “John” Dominguez was born in Big Spring April 5, 1960. He married Irene Olivas in Big Spring July 22, 1989. (4) Benjamin Dominguez was born November 18, 1961 in Cheyenne, Wyoming. He died of pancreatic cancer in Big Spring October 23, 2011. He married Sylvia Olivas in Big Spring June 20, 1987. (5) Raymond Dominguez was born November 7, 1963 in Cheyenne, Wyoming. 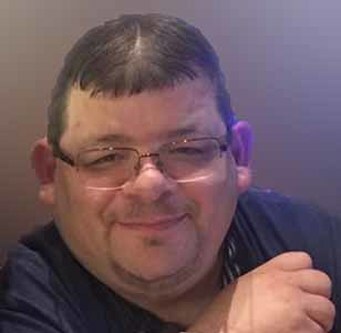 (6) Anthony Lee Dominguez was born in Big Spring June 26, 1967. In July 2012 he was living in Odessa. (1) Daughter Angelique Michelle Gómez was born May 25, 1969 in Big Spring. She married William Latimer November 20, 2007 in Big Spring and in July 2012 they were living in Big Spring. The information and images for this page came from family members Alicia Chavarría Williams, and Alberto Chavarría Jr.
and Bob Wirt's site Life Before the Ruins. This page was updated June 1, 2016, April 1, 2018.